An Irishman now residing in the Black Country has warned his opponents they will feel his power as he begin his journey as life as a professional boxer. Steven Power hails from Cork but has lived in Blackheath, Rowley Regis, for the past two years. The 21-year-old super lightweight will become a part of the local paid fight community when he steps through the ropes in Wolverhampton next week. 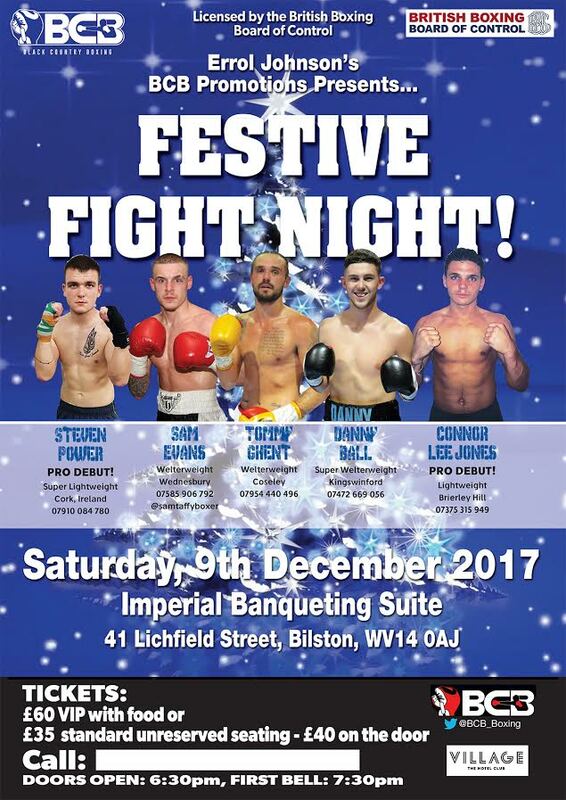 He’s a part of BCB’s second offering at the Imperial Banqueting Suite in Bilston, with Errol Johnson’s promoted bill titled ‘Festive Fight Night’ on Saturday, 9th December. Power was a regular amateur before arriving in England, representing St Colmans on 49 occasions with 37 wins to show for it. He then headed to England to live with his uncle, Paddy Power, and you can bet his interest in the sweet science has continued. After competing on the unlicensed circuit, he approached coach Richie Ghent with aspirations of training and turning over at his RG Box Fit gym, ironically also in Bilston. Being chucked in for sparring with prospects Danny Ball and Tommy Ghent – who join him in featuring at the Imperial – convinced his trainer he’s got what it takes to go forward. “I used to box in Ireland but I moved over here to look for work and there was an unlicensed gym close to my house,” he explained to bcb-promotions.com. “I had a couple of bouts for them. “I had a friend who knew Richie and we got in touch, it was me who wanted to go down there and they didn’t go easy on me when I did! “I was in there sparring with the likes of Danny and Tommy, at first, they were getting the better of me. After a while, I was starting to hold my own. “It’s always been an ambition of mine to become a pro boxer, so to fulfil that goal will be great but I’m not just coming to make up the numbers. I’m going to go give it a go and see how I get on, but I’m told my head movement is good and I can punch hard, so we’ll take it from there. As well as Power and Coseley’s Tommy Ghent and Kingswinford’s Danny Ball, Wednebury’s Sam Evans and Swadlincote’s Connor Parker are also in action. Tickets are priced at £35 for Standard unreserved tickets or £60 ringside to include food. They are available by calling the boxers direct or visiting iboxingtickets.com.